Wheat Flour, Water, Hydrogenerated Vegetable Oil, Edible Vegetable Oil, Sugar, Iodized Salt. TAWA: Place Paratha directly on Pre-Heated tawa. Heat on low flame for about 3 minutes overturning the paratha every 25 seconds till golden brown on both sides. 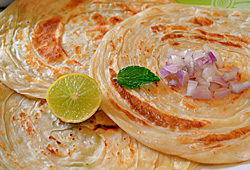 OVEN: Pre-heat the oven to 180 C. Place multiple paratha on cooking sheets and heat them for maximum 7 minutes. Frozen Food Compartment (-18°C) Frozen Food Compartment (-12°C) Frozen Food Compartment (-6°C) Please store the product below -18° C for best result. Delishh takes adequate care to reach their product to the retail point at this temperature. Changes in quality may occur if the product is thawed and refrozen.